Landscape edging adds to the curb appeal of a home, yet it does much more than this. It helps to differentiate various parts of the yard, ensure grass does not encroach on a garden and eliminates the need to trim the edges of the landscape. To obtain the most from this decorative item, however, homeowners need to compare the various options available to them. Lawn and garden edging comes in many sizes, shapes and types. Each type has its advantages and disadvantages that must be weighed before purchase. Furthermore, cost and ease of use vary significantly when it comes to these items, and homeowners need to factor this into the decision making process. Following are some types of borders that a homeowner may wish to make use of. Regardless of which type is selected, the edging adds definition and texture to the landscape. 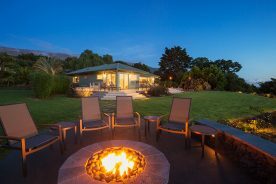 In addition, it makes the landscape complete, thus this is one item no property should be without, and one or more types are sure to be right for every home. 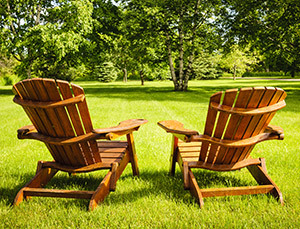 Wood remains a popular landscape edging option with many homeowners. This timeless material can truly transform an average landscape into a breathtaking one. One thing to consider when selecting this option, however, is any treatment the material has undergone. Landscape edging will be exposed to the elements, thus wood that has been treated with this is mind is crucial. 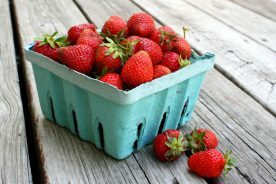 Certain woods, though, are naturally resistant to rot, insects and more, and a reputable garden center will be able to provide information on which fall into each category. Many properties have access to a nearby forest, and this is a great place to find free landscape edging materials. Look around for trees that have fallen, as the logs can be used for this purpose. 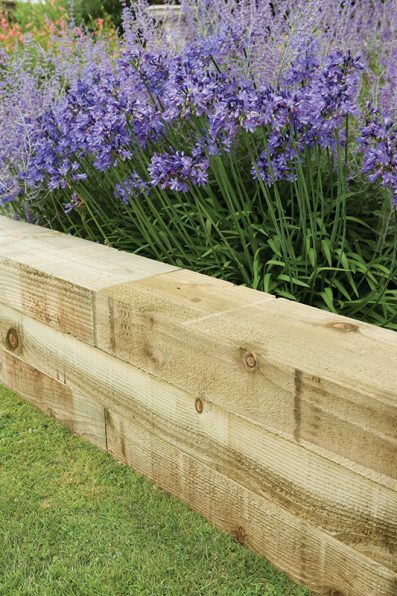 Edge a garden bed with logs to give it a rustic and fun look, or use them to line a pathway. This helps visitors know where to walk and where to avoid stepping on fragile plant life. Why spend money on landscape edging when the property may provide it for free in the form of branches? Go through the yard and gather up a number of branches of a similar size, preferably ones that are fairly straight. 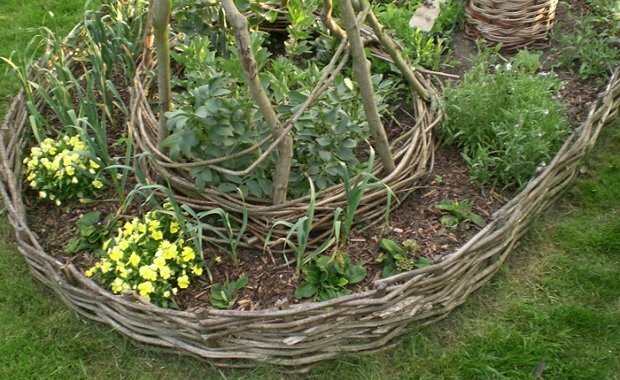 Bring them back to the home and tie them together to form an edging. 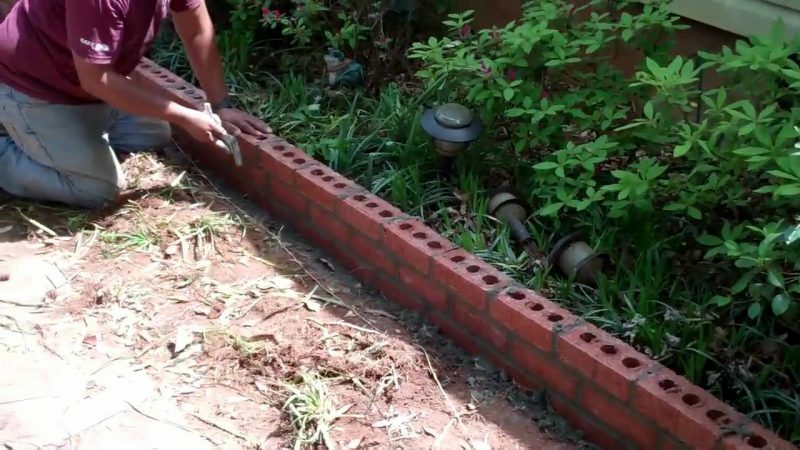 This method is great for separating garden or flower beds and is completely safe for the planet, of concern to many homeowners. Best of all, the only cost involved when using this option is for the material used to join the branches together. 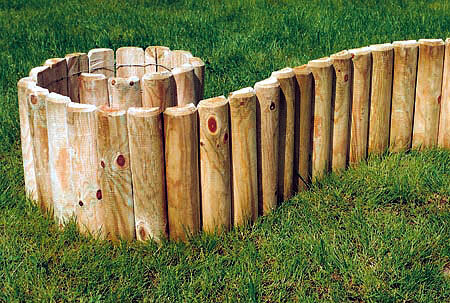 Log roll lawn edging adds a rustic touch to a property and is very easy to install. The logs are pre-cut and come in both full and half-round versions. They are joined with the help of a backing material and come rolled to make them easy to transport. 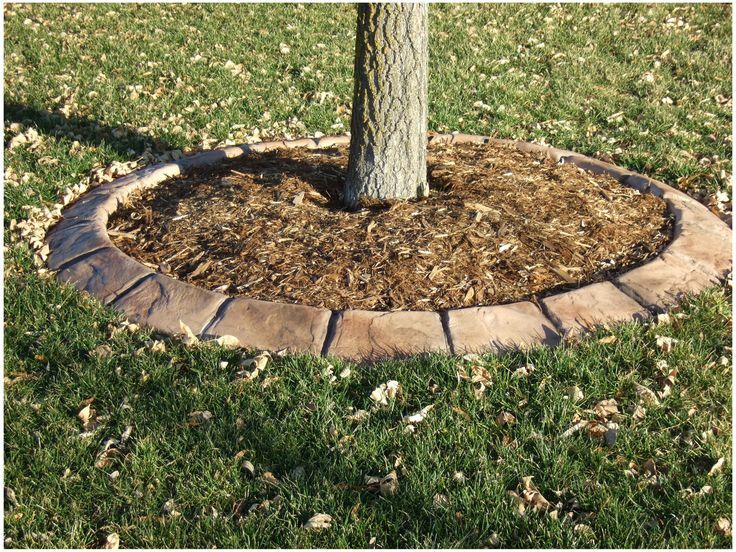 Use this type of edging in curved or irregularly shaped areas of the landscape or where mulch and other bedding material needs to be contained. Other options include railway sleepers, wooden blocks and more. Railroad ties may be purchased from a home improvement store or lumber yard, or a person may be lucky enough to find some that are being discarded when a railway is being redone. Regardless of where they come from, these ties are a great way to edge one or more areas of the yard and are often used for garden or flower beds. If using them for beds that will contain food products, look for ones that are made using untreated wood, such as cedar, so no chemicals leak into the food products. Landscape timbers are very similar to railroad ties, and these materials are inexpensive and durable. They may be used for garden and flower beds, keeping the above warning in mind, yet they are also great for lining a path or differentiating parts of the landscape. Many homeowners choose to use these items around a play area for the children, installing the timbers and then adding mulch inside the border to soften the ground for kids at play. Metal, such as curved steel, is considered to be one of the most elegant options available today. Not only is it timeless, but it tends to be understated, thanks to its practical and clean-cut nature. 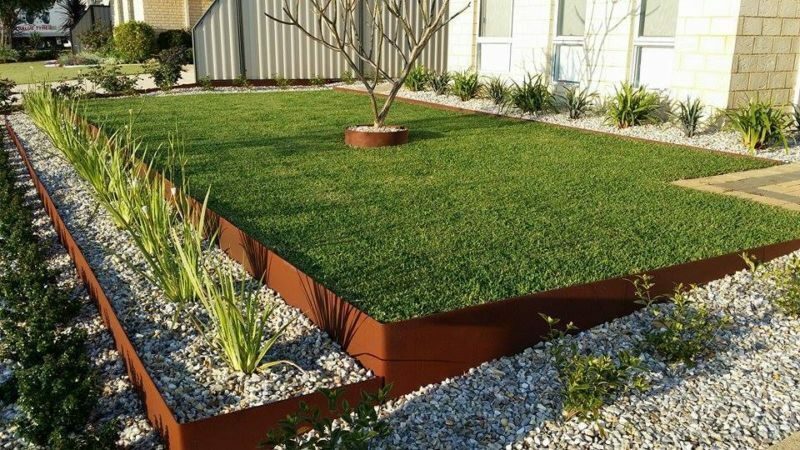 Using metal helps to ensure grass won’t move into adjacent paths and beds, and it prevents the migration of mulch, gravel and other materials commonly seen in a yard. Furthermore, it can withstand the elements with ease and is resistant to ground movement, of concern in many parts of the country. The cost for this edging material varies based on the type selected and the amount needed, and very little maintenance is needed once the border is installed. 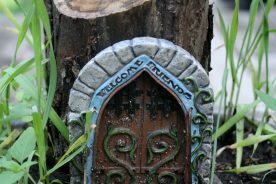 An inexpensive edging material, plastic or resin doesn’t have to be the boring, plain edging of the past. While people often think of the rolls of hard plastic that their parents used, it’s time to be creative. Purchase the roll and dress it up or buy plastic pipe, cut it into various lengths and install the pipes as a landscape edging. PVC pipe is great for this purpose also. Resin borders come in decorative patterns as well, allowing each homeowner to select one that blends in with the overall landscape plan. Stone and brick edging remain popular items with many homeowners, as they can reclaim these items from their property. The only expense involved is when enough of the desired material is not available. Numerous looks can be created from brick and stone, including fun and frivolous landscapes or formal and elegant ones. 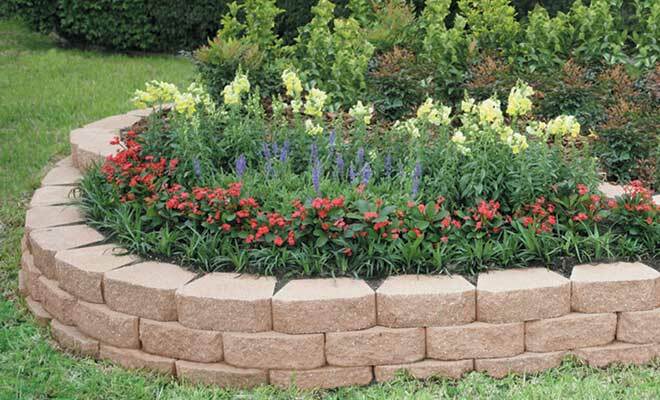 Landscape blocks are perfect for keeping grass out of a garden. They may also be used to offset curved areas. One reason they are preferred by many is they won’t be damaged by lawn equipment, a problem with certain other types of landscape borders. Terra cotta landscape edging is frequently seen in English gardens, and many Americans love this trend. It may be used to line a border path or to set off a flower bed, and it is useful for defining curves. No matter where it is used, it is sure to provide an elegant look to the area. Red bricks can be used in a variety of ways and in numerous locations. Lie them flat, angle them or turn them on one end. The ideas are endless, so be sure to try different sizes and positions to find that one that best serves the desired purpose while enhancing the overall landscape. Concrete is a natural item that fulfills many functions in a landscape and blends in with several architectural styles. Many homes already have concrete available for use, making this an inexpensive choice. For those who aren’t in this situation, concrete landscape edging options can be purchased for a very low cost. Stamped concrete allows for a custom look, and homeowners find they have numerous options to select from. In addition, a color may be selected that truly complements the landscape and home. Different molds are available; thus individuals need to consider all options when they go to install this type of border or edging. Be aware, when working with a landscaping contractor, that they may not offer all options. For this reason, it’s best to get quotes from multiple companies. When cinder blocks are no longer needed, people often wonder how to dispose of them. Don’t do this. Turn them into landscape edging, as they create a clean, geometrical border in very little time. Make certain the holes face out, as this ensures good drainage, or another option is to turn them into mini planters that hold different types of vegetation. Why head to the store to purchase landscape edging when there are items around the home that may be perfect for this purpose? Many people collect things over the years, then wonder how they can best display them. Using them as a border in the landscape may be the perfect solution, depending on the collection obviously. 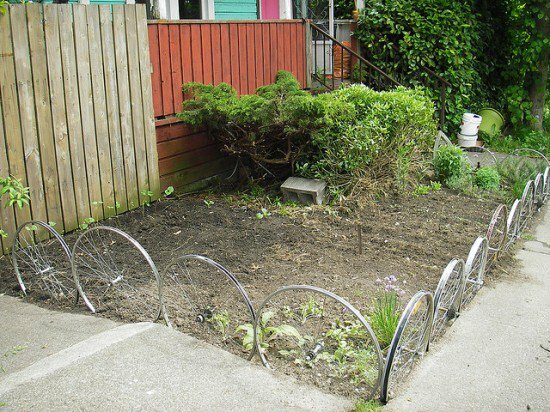 Gather a bunch of metal wheels and use them to offset a flower bed. Insert half of the wheel into the ground and make certain it is secured. Do this around the desired area and obtain more wheels, if needed. This is definitely a unique idea that will give the yard a distinctive look and one that homeowners may soon find copied by others. Wine bottles seem to collect over time. Although they can be recycled, why not use them for a different purpose? 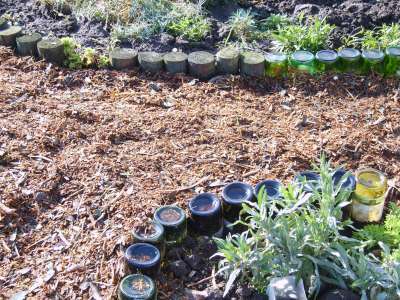 Turn the wine bottles upside down and use them for landscape edging. Depending on one’s wine preferences, different colored bottles may be used or they may all be of the same color. Regardless of which route a person chooses to go, they are not only helping to save the planet by recycling the bottles, they are doing so in a fun way. A beach house is a dream of many, yet remains out of reach. Bring the beach home by using clam shells as landscape edging. Large shells may be used, or they may be crushed to give the area the look and feel of a rock garden. Don’t hesitate to combine materials when creating edging for a property. For example, use wood and stones together to edge the property. Place wooden railway sleepers at set intervals, install some chicken wire running between the sleepers and fill the wire with medium stones. 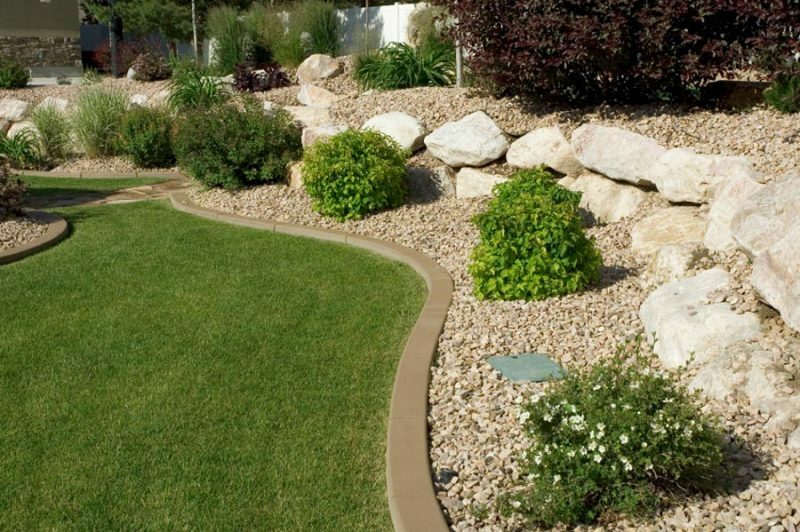 This truly unique landscape edging helps distinguish a property from all others around it and will catch the eye of those who pass by. Be sure to take into consideration the architecture of the home and the overall feel of the landscape when making this selection. The edging shouldn’t be the prominent feature when one sees the home. Use it as a decorative touch, and it will allow the property to shine. 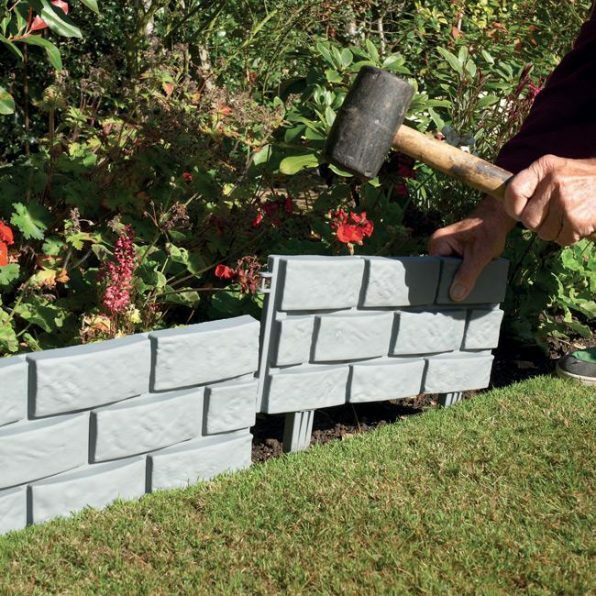 That specific edging is actually only available in the UK (https://www.wayfair.co.uk/Gablemere-Brick-Effect-Garden-Edging-GAME1110.html). Suncast makes a different style which we like to use. You can get it at Amazon here. I’m glad you mentioned that concrete edging is inexpensive. My family just moved into a house with a large yard, but the grass is growing into the flower beds and the driveway. We need to get some landscape curbing done quickly and cheaply, so maybe concrete would be a good choice for us.